Rocco's Pizza & Deli ~ City of Escondido, CA Handcrafted Pizza anyone? "Home of the Giant Pizza since 1983"
As some of you may know, we live in the City of Escondido, California, and we really enjoy exploring the different businesses around. Among our favorite places to visit, are those where you can discover new flavors and indulge our palate. The reality is that we live in a busy world, and although we love cooking, sometimes we just don't have the time to do so. With that being said, and with the excuse of the weekend soon approaching, we decided to try pizza at "Rocco's Pizza & Deli". This small, but friendly pizza joint is located at 205 W. Mission Ave., Suit N, Escondido, CA 92025. Once you are in the shopping center, the red sign makes it really easy to find. For the most part, we like eating pizza while watching a movie. Therefore, we were definitely going to order the food for pick-up. Rocco's Pizza & Deli has a website, which was very helpful in our new dining adventure. In it, you can find the menu, weekly specials, and more information regarding their services, which include catering. You can visit Rocco's Pizza & Deli's website HERE. We felt the website was very helpful, because we like to take our time to choose what we want to order. Being able to see a menu ahead of time, in my opinion, is very practical and I am glad we were able to do so in this occasion. We were surprised that Rocco's Pizza & Deli also offered; salads, pasta, calzones, sandwiches, homemade desserts, and other side dishes. That totally made our weekend, because when you are used to franchise pizza places, you don't usually think of all these other options for individuals that are not that much into pizza. I know, you might be thinking "What? Who doesn't like pizza?" Oh believe me, I have some of those rare creatures in my family, lol. We really appreciated being able to have other options available from one same place, where everyone in the family could have something they could enjoy. I felt the prices were fair, considering the type of food that was served. These can also be found through the website, making it easy to calculate how much you are going to spend with your order. We went ahead and ordered two large pizzas, an order of manicotti, which comes with garlic bread and meatballs, and we also ordered a large Greek Salad. The phone call was very straight forward, and we were told that our order would be ready in about 25 minutes. In my opinion, that is just about the same time any other pizza place takes to create an order. Therefore, we were very happy to hear we didn't have to wait that long to pick up our food and eat. However, if you prefer to get your order delivered, Rocco's Pizza & Deli does offer that option for a reasonable fee, information you can also find at the website. If you'd rather eat at the place, Rocco's Pizza & Deli also provides clients a means to eat right at the spot. That way, if you are just driving by and feel the craving for any of their wide range of dishes, you can just bring your family in and enjoy. I suppose that if you don't want to wait long before eating, you can also call in ahead of time, and then just arrive and eat there in about the time they let you know your food will be ready. When we arrived at Rocco's Pizza & Deli, we were greeted cordially. Just so you know, the staff didn't know we were visiting on behalf of the blog to write a featured review on the service. We like doing this, with the purpose of having the most honest experience from businesses and restaurants we share with you through our blog. I don't know if it was my distinctive voice through the phone, but the lady at the reception recognized it, and told me my order was ready. That made me very happy, because I didn't feel like "just another client". Since our order was ready by the time we got there, we didn't really stay long. Regardless of that, as far as I could see, the place looked clean and bright. I wouldn't mind eating at the location if we chose to do so in the future. It is not a big place, however, consider that most of the people that eat pizza, don't usually come in and eat at location. Most people that eat pizza, do so with the purpose of bringing it home, or to a special event with friends. I guess our order included some promotional sodas, because right away they offered them to us, and reminded us not to forget them. Since we are not very much into drinking commercial sodas, we decided to pass on the offer. However, the staff offered the option of Lemonade. Although we also declined the offer, because of the same reason, I liked that they were kind enough to offer, just so that we didn't leave empty handed in the "drinking" department. We ended up taking one of the two drinks offered, since we could always just share it with friend. Soon after, we were on our way back home with our food. The smell of the pizza was so good, that by the time we got home, which was just about five minutes away, we couldn't wait to dig in. The pizza in the image above was the Rocco's Special, and the one you see below, is the Sunny Delux. Although they were both really, really good, I have to super recommend the Sunny Delux. I would have never imagined that the taste of artichokes would go so well on a pizza. To be honest, just writing about it gave me the cravings. I will definitely order this pizza again in the future. The Greek Salad was very good too. When we make salad at home, it is very much like this one, so it felt like if we had done it ourselves, plus the amount of ingredients was very generous and even. You can see in the photo below how the beautifully created salad looked like. Of course, we could do with more Feta cheese, but that is just us, because we are used to it. However, we understand that not everyone likes Feta cheese, or a bigger portion of the ingredient for that matter, just because the taste is very strong. Nonetheless, if you are like us, and like extra cheese, I am sure you can ask for it, and work something out. I hadn't eaten manicotti in seven years, so I was really excited about trying it out. The order includes three manicotti pasta rolls, two meatballs, and two pieces of garlic bread. I had forgotten how filling the manicotti could be. In my opinion, if you are ordering this for yourself, be aware that it may feel like a lot of food. So you could try sharing, or having some for the next day (unless you are trying to tame a fierce hunger, then go ahead and eat at your own pace). I have to be honest. I was a little disappointed with the presentation. I don't know how it is served at the location, but when we opened the container with the manicotti, I saw a puddle of sauce and two meatballs. Again, I don't know if this is usually how they are served, but I was expecting to see the rolls and have some sauce on top of them, not have them totally covered in the sauce to the point that I couldn't tell what this was. Then again, if you don't really care for that sort of thing, I guess it really doesn't matter as long as it tastes good, right? I decided to take it out and serve it on a plate, just so that I could actually see it, and be able to share a photo of this dish. A bit messy, as it is expected with anything that has pasta sauce, so just watch it with your clothes when you are eating. I do have to say that I liked the sauce. Who knows, maybe that's the reason why they give you extra sauce on this dish. I am going to say that the manicotti and the garlic bread were okay, but I did not like the meatballs. And that is fine, because that doesn't mean that you will have the same experience. 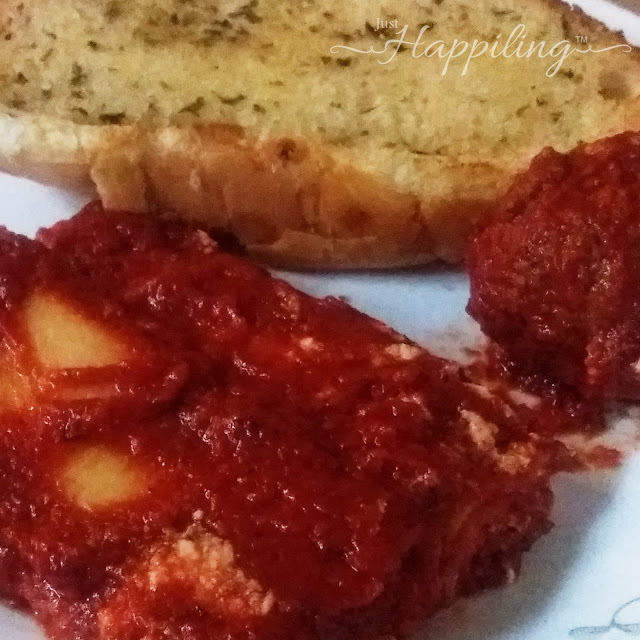 As an example, my husband liked both the manicotti and the meat balls, but he wasn't that pleased with the garlic bread. This just means that; you may not necessarily enjoy something we do, and vice-versa. That is why we totally encourage you to use this review alongside with others, so that you can make a more informed decision and try to see what you and your family like best. For us, that just means that we get to try something different the next time. Something I thought worth mentioning, is the service time. I would say that in many occasions, we order pizza because we have unexpected guests, or it just becomes the splurge of the moment. You will be happy to know that for those occasions, Rocco's Pizza & Deli is open Saturday through Sunday until 8:30 pm, and on Fridays, until 9:30 pm. For more information on service hours, visit their website HERE. All in all, we had a good experience for our first time at Rocco's Pizza & Deli. Although not all of our orders where great, that's exactly the reason why you try different things until you find the dish you truly enjoy. For us, finding a place where they treat you nicely, and where you have options of food to try, is what dining out, or in our case ordering food, is all about. For a while, we were going about not eating pizza, just because we were tired of the same old franchise style food in which they don't even care if they are sending you a: burnt, cold, poorly made, or even wrong pizza. However, handcrafted pizza is something very attractive to us, and I am sure to many others that are tired of the "norm". And for that reason, we do recommend you visit Rocco's Pizza & Deli, and try it for yourself. I can't wait for it to be movie night again, so that I can taste that savory Sunny Delux pizza again. So what do you think? 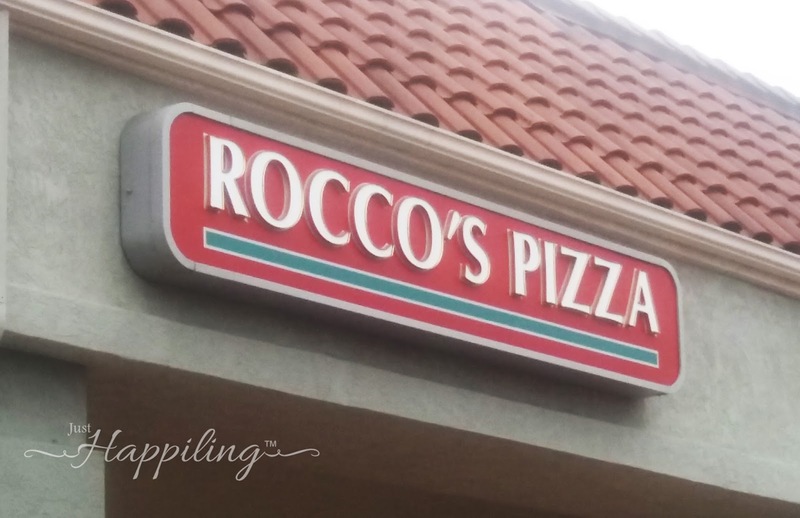 Have you eaten at Rocco's Pizza & Deli before? If so, what is your favorite pizza and why? Is there anything other than pizza that you would like to try from Rocco's Pizza & Deli? Please let us know in a comment below. We would really love to hear your suggestions, and I am sure that the rest of the community would do so too. If you'd like to read more content like this, please subscribe to our blog via email, or through your favorite social media venue, which you can find in the right side bar of this blog. If you'd like to be featured at Just Happiling, don't hesitate to send us an email and we'd be more than happy to read you. Thank you for being here and being part of our Just Happiling community. I hope that this post helps you discover a new place you can enjoy with friends and family, and that it helps you make a better informed decision if you go ahead and try Rocco's Pizza & Deli's services. We hope to share new and awesome content for you soon. Until the next time, remember to smile--because it is contagious! Disclaimer: This is a sponsored blog post. Although we were compensated to write this post and shop at the business described above, all opinions are 100% our own. All photos and content in this blog post are copyrighted and belong to Just Happiling. You do not have the right to redistribute this information, unless you have our written consent. Remember that what works for me and my family, may not necessarily work for yours, and we merely provide a means for our followers to be able to make a more informed decision.